The format of this episode returns to the classic chase cartoon format of the first two, albeit with a newly-introduced character giving chase. The addition of masochistic dog-spirit Momou to the cast creates a variety of new avenues for physical humor; the episode’s first salvo of gags takes great advantage of this. Hiro Shimono, as Momou, gives an energetic performance that pushes the scenes he features in that much further over the top. 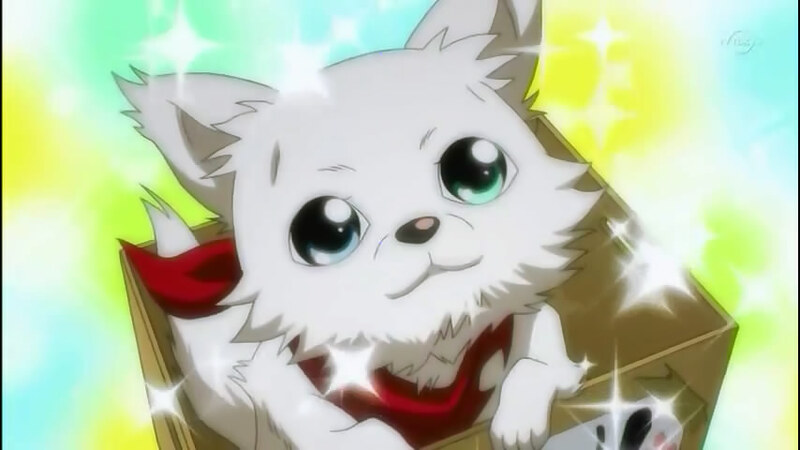 But more immediately, his supernatural abilities are key to the structure of this episode’s chase: Momou, disguised as a dog, befriends her and attempts to steal her good luck stealthily. This gives the episode a fresh flavor, as the physical humor is less direct and feels more like a comedy of errors. Moreover, Ichiko’s absurd good luck finally stands out in relief, as her emerging from each attack unscathed is driven entirely by luck rather than by any intentional action. This episode’s humor is anchored by some fantastic slapstick, including one particular sequence which demonstrates the studio’s skill and confidence in its gag design. In the original work, at one point Momou tries and fails to attack Ichiko in a dirty kitchen, and in the aftermath is almost impaled by a number of kitchen knives. This gag constitutes only a brief panel in the original; the anime expands on the gag, adding layers of complexity and more visceral impact, making the scene much more comically satisfying. The final scene of the episode, too, escalates in chaos at a steady clip for a full two minutes. Besides serving as an effective defusing of the built-up dramatic tension, the scene ties off all of the episode’s loose ends neatly, and also ends the episode on a lighthearted and fun note. The animation is fantastically lively and expressive, and the soundtrack leverages three different pieces to control the flow of the scene. In a sense, one can pin this episode as the ending of the season’s “first act”: one third of its length has passed, and the principal characters have been introduced. This final scene suggest that as well, as it quite elegantly reintroduces all of the series’ major recurring elements and gags. Keita and company play a major role again in the next episode, and there’s a lot of crying and unearned drama. That said, the premise is clever, and supported by some decent gags. It’s a two-part story, so it may be interesting to see how Sunrise structure it, given that their adaptation of the manga’s dramatic moments has been somewhat more liberal. They definitely got back to what they do best this time around. The first episode still beats it, but it’s in a close second place. The drama was certainly better and it didn’t get in the way of the comedy nearly as much. My hopes are high for the rest of season; I just hope Keita isn’t part of it. Yeah, I’m feeling pretty good about the groove they’re getting in to. Though they’re skipping two pretty funny chapters to get to next week’s episode so I hope they go back for them.